Born in 1962, Guillaume Leyte defended his doctoral thesis in 1993 at the University Paris 2 Panthéon-Assas and was elected president of the university in 2012 and re-elected by his colleagues to the helm of the presidency in 2016. Associate of the Law Faculties (History of Law and Institutions) in 1994, a history professor of law, and his research focuses on comparative law and institutions history, comparative constitutional history and the history of legal thought and policy. He taught at the universities of Strasbourg, Amiens and Paris Descartes before being appointed in 2002 at the University Paris II. He leads since 2005 the Institute of History of Law and currently chairs the Department of Roman law and legal history since 2009. 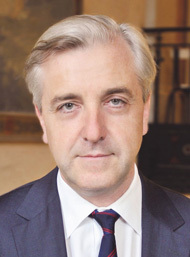 Internationally, in 2010-2012, Guillaume Leyte was deputy director of the Institute of European and comparative law at the University of Oxford. In addition, he was elected three times to the prestigious National Council of Universities (CNU) and two-time national competition aggregation history of law and institutions.